Until more or less 10 years ago, I wasn't a comics fan. One day at my local library I decided to pick up some less known titles during one of those “I have to try new things” kind of phase. 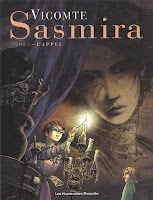 The book was called Sasmira, a mysterious time travel who caught me right away under its spell. The story starts in modern Paris. While walking in the street, Stan, a known musician, hears someone calling his name. He sees then a very old woman who gives him an strange ancient ring and asks him to return to her. Moments later she dies in his arms. Trying to know her identity, he finds in her pocket an old photograph dating from the beginning of the 20th century. To his astonishment, he feels powerfully attracted to one of the women portrayed. His curiosity awaken, he tries to find out more about the house he sees in the picture and asks for the help of his girlfriend, Bertille. This is, until today, one of my favorite historical comics. Not only the drawings are beautiful, but the story is compelling mixing mystery, adventure, history and even romance very well. The characters are endearing, especially the young woman, Bertille. She is sharp, intelligent and very outspoken. In the other hand we have the quiet and secretive Stanislas. We feel they have a recent relationship and when Stan disappears for weeks without any explanation, disturbed by his encounter with the old woman, Bertille immediately imagines he was having an affair. She is exasperated by his behavior but her attraction for him is too strong. Even if she helps Stan in any way she can, she never forgets to tell him what she thinks of him, now and then, in a very humorous way. The beautiful drawings, the precision and detail of the costumes and surroundings, especially at the mansion, are one of the strong points of this book. It's really a wonderful work! I confess that it was one of the reasons why I was attracted to the book in the first place and I was happy to see the story matched the drawings perfectly. The underwear, the jewels are perfectly captured. The among of research done is obvious in each single page. This first volume called: “The Calling” (L'Appel), shows us the beginning of an unpredictable story that I really cannot wait to continue reading. Until today only the first book was publish but the second is announced to be release very soon. I've been waiting for the sequel for more than 10 years, so I can only say that I'm excited! This looks very promising. I am having a little trouble finding it for sale though. It looks like I am going to have to do some hunting for it. Thanks for the great review! The second volume has been recently published (November 2011)I am afraid for the time being only in French. There are no know plans for publication in Dutch or any other language. But how could that be, as this is one of the most exquisite cartoons I have ever seen? The second volume is called 2 - la fausse note (the false note) and the drawings inside are even more breathtaking, the storyline even more mysterious and compaling that the first one. My husband has been waiting for ten years for the second volume (similar story as described in the article above) and I cannot begin to describe my childlike happiness and excitement of handing him out Sasmira 2 as a Christmas present! I have just noticed that the second volume could be purchased on amazone.com. Even if French may not be your language, this is a buy a strongly recommend.